It turns out there was nothing wrong with my computer. It's a long story involving some tears and frustration that you don't really need to have inflicted upon you. Let's just say that sometimes, even if it does look like a duck and quack like a duck, it might actually only be a chicken. It took three wipes of my hard drive to figure that out. I must say, my computer is now running more smoothly even than when I first bought it, so there's that silver lining at least. I didn't do much during the time I was trying to figure it out. Except for the whole wheat french bread, a little baking, and some lentil soup. More on those later. It also got hot while I was preoccupied with my computer. We've climbed up close to (and even into) the 90s, which is way outside my comfort zone. I don't feel much like cooking when it gets that hot, and I certainly don't want to make anything that's going to involve a lot of time in a hot kitchen. I've written about skirt steak before, but I thought this would be the perfect time to reintroduce the subject. It's an incredibly flavorful cut that cooks on the stovetop in just minutes. How many minutes depends on how well-done you like it, of course, but it only takes about six minutes if you like it medium rare, and maybe eight minutes if you like it a little more done. And in one of life's little coincidences, Emeril Lagasse is grilling up some skirt steak on "The Essence of Emeril" as I am writing this post. But I think he's a little confused. He just said that flank steak, London Broil, and hangar steak were all the same. That's wrong. 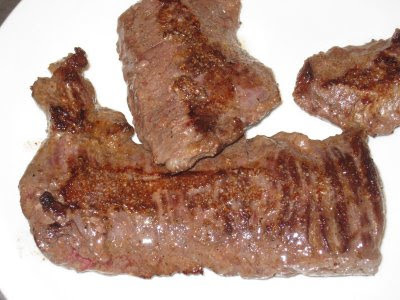 London Broil is a cooking method, not a cut, and hangar steak is not the same as flank steak. But all of them are delicious, and relatively fast to cook. This method for skirt steak is by far the fastest. Take the steak out of the refrigerator at least half an hour before you are going to cook it, and let it come to room temperature. Open it up and inspect for any silver skin. Skirt steak usually comes well trimmed, but it never hurts to check. Remove any excess fat and any silver skin that might still be on the meat. 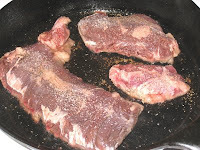 Season the steak with salt and pepper, and garlic powder, paprika, or any other herbs if desired. This time I just used salt, pepper and garlic powder. 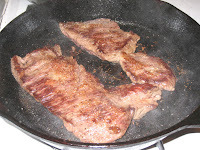 Heat a large skillet (cast iron is preferable, but not required) over high heat. Add about a tablespoon of an oil with a high heat point (grapeseed, canola, peanut). When the the oil is rippling and looks like it might be separating, add the steaks to the pan carefully (laying them down away from you to avoid splatter burns), seasoned side down. They should start sizzling loudly as soon as you lay them down. Once they are in the pan, season the top side with the salt, pepper, and other herbs or spices. Cook for 2 to 3 minutes for medium rare, or 4 to 6 minutes for medium well. You can cook it longer if you like it more done, but it will be tougher. Do not touch the steaks, or move them. You want to get that beautiful brown sear going. Turn the steaks carefully, and cook for about the same amount of time as you cooked the first side. Again, do not move the meat around in the pan. You want that second side to get just as nice a sear as the first. When it's done, turn off the heat and remove the steaks to a plate so they can rest for about fifteen minutes. This would be a good time to work on or finish up any side dishes you are making to accompany the steak. When you are ready to serve, be sure to slice the meat against the grain, so the pieces will be more tender. This steak was cooked for about two and a half minutes per side. The more I work with meat, the more rare I am starting to like it. If this is too rare for you, just cook it for another couple of minutes on each side. 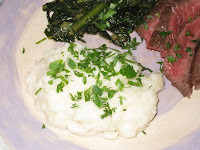 Mashed turnips and potatoes and braised dandelion greens rounded out this dish. Taking into account the twenty minutes it took to cook the potatoes and turnips, it took just under an hour to make this meal. Skirt steak is versatile. You can serve it hot right out of the skillet, or you can use it in a cool summer salad. However you want to serve it, it's a go-to dish for those days when you're too hot or too tired to put on the dog but still want a satisfying, delicious lunch or dinner.